Adrenaline is often defined as inherent, or something that moves you to do things when one least expects. Till the last few minutes, I didn’t know I would be tossing my hat in the ring for the month long marathon. With a few posts ready under my belt, we see a month long (26 posts - alphabetical in my case) of how grains could be used creatively ( including some classic dishes too). All these would be featured in the Bm#99 Mega Blogging Marathon all this April at this blog. As I mentioned alphabetical, it would be appropriate to being with A for Achari Methi Channa Pulao. I am a sucker for one pot meals, and although rice based meals have been my preference, this mega BM has given me a chance to explore other grains too. This biryani today of course is Rice based, and is adapted from Suma’s recipe. Wash rice in several turns of water till clear and soak for 15 mins. Heat a thick kadai / pressure cooker, add oil or ghee, saute the whole spices, onions til fragrant. Add fresh Methi leaves and saute till they slightly wilt. Now add the soaked and drained rice, peas and carrots, and saute for a minute, add red chillii powder, biryani masala and saute till the oil starts leaving, Now add the pickle along with the oil (mango pickle leaves a lot of oil and colour, but my lemon pickle didn’t have much, so got an yellowish tinge). Add enough water as per rice quality ( i used about 1.75 cups of water), throw in the mint and pressure cook for 1 whistle. Let the pressure come down on its own. It is always a challenge to challenge yourself , great you could join in . 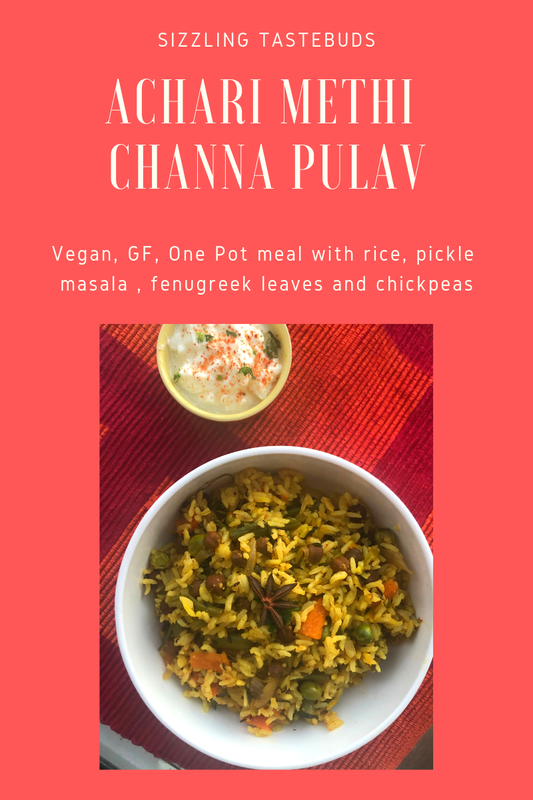 What a flavourful pulao ! Achaari Pulaos have always been my favourite and I surely am drooling over this at 4am ! Love the addition of methi to it . Looking forward to your posts on different grains . That is a tremendous start to the mega BM. The acahr adds a nice spice to the pulao. Even I prefer such one pot meals to the standard rice and curry. This is going to be so much fun Kalyani. Good that you joined us Kalyani. I can imagine the excitement Mega BM gives us. This a fantastic recipe to start with. Such a flavorful Pulao I must say, very nice Kalyani. Achari flavours is lovely when added in pulao ,Simply yummy.. Will try this way when i prepare pualo with channa next time!! So glad you decided to jump in. Knowing you I am sure to learn some innovative uses of varied grains. This one pot meal looks delicious and perfect for a weekday dinner. Wow! 3 am Kalyani? Hope you will successfully complete this marathon despite the challenges you mentioned. I used the Achari clause as well but this methi chana pulao sounds tempting. I love this flavorful rice recipe... Achari is big hit for letter A ... And i can feel the aroma of achar or pickle in this recipe. I am so glad that you joined us Kalyani. Feels so good to comment on your blog after a long time. A great start with achari pulao. Let's rock on. Never knew there are this many types of pulaos! Achari pulao sounds very interesting and looks irresistible! Thanks for sharing! Great that you decided to join. Adding achar to a pulav is a wonderful idea, will add so much taste to the rice. Yum.